If your child is around 18 months or older, maybe you’re anxious to start potty training or maybe you’ve already tried in a few less-than-successful attempts. However, you must remember that timing is everything; not only you have to be ready, but so does your child. You can check out our Kinedu blog to know what are the developmental milestones your kid most achieved before starting potty training. Another time factor you must consider is yourself, as you will be the one potty training! If you have a trip planned or if you’re planning to move to a new city, it’s better to postpone potty training until your child’s environment is stable and secure. Once you have decided you and your baby are ready for potty training, it’s time to decide on a method and a potty. The two basic potty options are a Standalone, and a toddler-size potty chair with a bowl. If you choose to modify your toilet seat, consider getting a stepping stool for your little one, so that he can reach the seat comfortably. Some moms say that the transition to a regular toilet is easier if you adapt it during potty training. The other option for potty is a toddler-size potty chair with a bowl that can be emptied into the toilet. The advantage of using this potty is that you can turn any space into a potty training environment. Some moms suggest having a potty in the car for any emergencies or for traveling. The disadvantage of it is that you will need to clean the potty every time your child is done using it. Have you ever wondered why picking your baby up feels like the most instinctive thing in the world? Turns out we are hard-wired to do so; it’s our maternal instinct to carry a baby. When a baby is born, he is very vulnerable, with highly limited vision and underdeveloped hearing. This means that touch is the way your little one is going to explore the world for the first couple of months while other senses are starting to develop. Touch is an important part of a baby’s development, but just how significant is it? In a recent study carried out by Nathalie Maitre from Nationwide Children’s Hospital and Vanderbilt University Medical Center, she and her colleagues measured the brain responses of 125 infants (including premature and full-term babies) and showed that a baby’s earliest experiences of touch have lasting effects on the way their young brains respond to gentle touch. The results showed that preemies had a reduced brain response to gentle touch in comparison to full-term babies. However, preemie babies in the NICU had a stronger brain response to touch when they spent more time in gentle contact with their parents or healthcare providers. What are the outcomes for babies who are born bashful? Is your child bashful? To determine the answer to this question you may ask yourself how would you describe your child’s temperament. Too often people tend to confuse shyness or behavioral inhibition with introversion (Weir, 2014). Even if shy and introverted children’s response to social interactions may seem the same, tehy’re quite different. According to Koraly Pérez-Edgar, a developmental psychologist at Penn State University, bashful children really want to socialize with others, but it’s too overwhelming and difficult for them. They really crave social interactions, but at the same time socializing is too stressful for them. On the other hand, introverted children are not really interested in social interactions, as they prefer spending time by themselves. So, how can you detect if your child is shy? Pérez-Edgar says that bashful children have these in common: they are timid and often show a coy smile. When can you find out if your child is bashful? 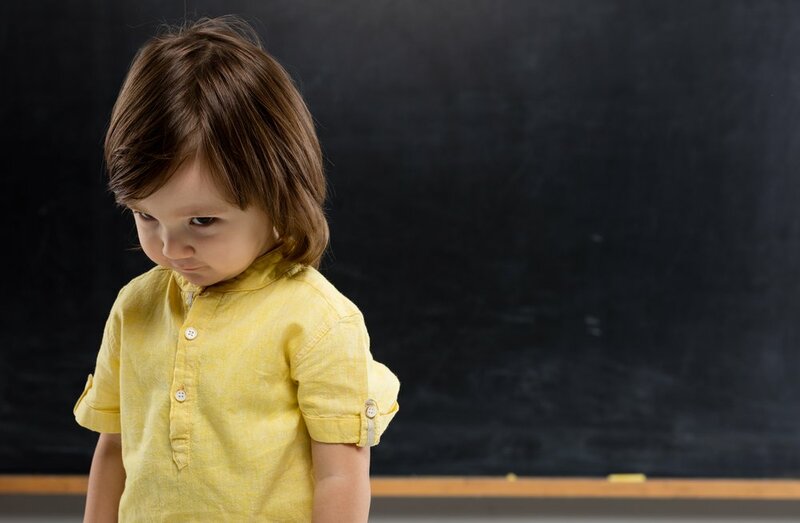 According to longitudinal studies from Harvard and the University of Maryland, signs of behavioral inhibition or shyness can be seen before a baby’s first birthday (Weir, 2014). One of these signs is sensitivity to novelty. For example, babies react with signs of distress when shown a new musical toy. Later on, this sensitivity to novel things gets canalized into a sensitivity to social novelty (Weir, 2014). This is one of the reasons why it’s more common for a bashful child to develop social anxiety compared to an introverted child.